Coconut oil is latest health and beauty secret. It is a natural miracle product. women and men have been using coconut oil on their face and skin and hair. * Cleanse away the day’s build -up of dirt and pollution by massaging coconut oil into your skin and gently removing the oil that has lifted the dirt away with a damp flannel. 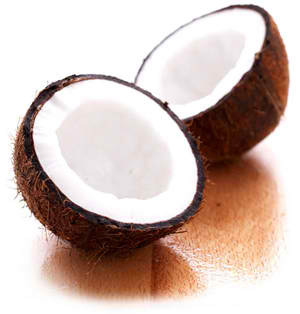 Coconut is anti-bacterial and anti-microbial, so it is perfect for protecting and enhancing the skin’s natural flora. * If your locks are looking more like straw than silk, massage coconut oil into damp hair to help strengthen them and add luster. Put your locks up into a shower cap and wrap a warm wet towel around it. Leave for twenty minutes and shampoo as normal. * Pop your feet into a warm footbath laced with three tablespoons of coconut oil. Add some mixed spice and coconut milk to enrich this rejuvenating foot soak. The lauric acid in coconut oil may assist with fighting fungal infections, and bring balance to your hard working feet. * Rich in moisturizing fatty acids, coconut oil makes a superb moisturizer, plus you’ll smell delicious too. Massage it into your whole body and don’t forget your décolletage for a balmy evening out – to add a gorgeous glisten to your skin. To enhance the glow add some sparkling mica to your oil mix. * Babies love to be massaged with coconut oil. Highly moisturizing with both anti-bacterial and protective properties, take some precious time out with your little one and coat them in this nourishing oil. * Is your skin feeling a little parched and flaky? Add some sea salt to your coconut oil and use it as a scrub for the body. Your skin will feel rejuvenated, soft and glowing within minutes.